Effective English helps you memorize basic words of English that are often used in everyday life. 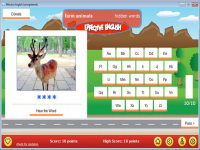 In this game, you can play various variations of education game to be able to memorize and increase your vocabulary. Effective English is not only in the form of text and typing, but it also includes visual and audio support that makes it more interesting to play. There are many topics provided on the first page shown after running the game. Just click on any topic and the game will take you into playing while learning. Overall there are six types of games that can help you memorize all the words provided, namely listening skills, flash cards, memory, choose a word, hidden words, and mixed up. This can avoid you from getting bored quickly because you can choose any type of game that you like, as the theme mentions: learning with fun and easy English. The license of this game is donationware, which is a form of freeware, which means users can download and play it at no cost, but the developers also accept donations if you'd like to support for the further development of the game.